I am trying to find an old cartoon, I remember it was about a young girl, possible a princess who was protected by a red robot on her journey. I also remember that her father (I think) created two robots, one was red and one black, and he give them a test to see which one could protect his daughter. The red robot was chosen, but the black one (I believe he was stronger) tries to stop the princess from getting where she is going. The black robot sends various robots after them but they are defeated by the red robot. I can't remember any names, but I think that most of the action happens in a desert, there are not a lot of interactions in this cartoon, mostly the girl and the red robot traveling together and fighting other robots. The girl might have been just the daughter of an important scientist (who created the two robots) and not a princes. She is young, probably a 10 years old. I found a similar question here where they say it is Zentrix, a 3D Chinese animated series, with an emperor scientist who has a daughter. 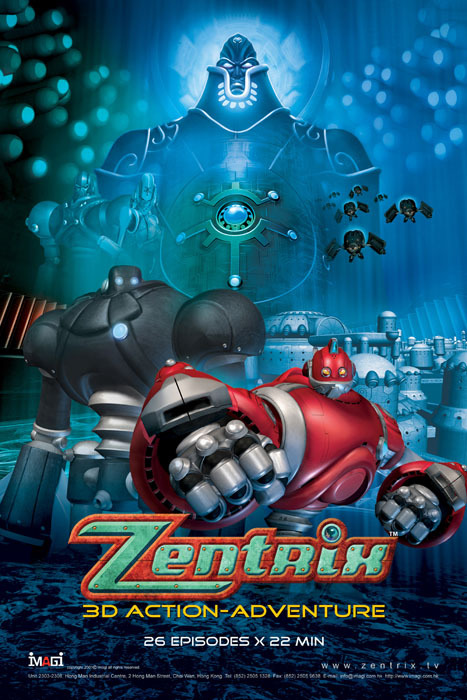 The promotional poster also shows a black and red robot. Jarad takes precautions and develops two fighting robots - Zeus and Quantum. Zeus is then chosen over Quantum as the protector of his daughter, Princess Megan, should his mission in time fail. Following this, Jarad and Roark head back in time. It's from 2003, I don't know if that counts as old. Not the answer you're looking for? Browse other questions tagged story-identification anime cartoon or ask your own question. Cartoon with bug-eyed alien, blond guy, black-haired girl and old scientist?